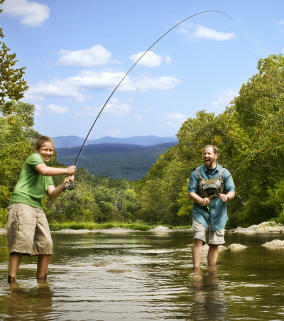 We have first-class fishing in the Roanoke Valley in Virginia&apos;s Blue Ridge Mountains. Serious fishermen pull some trophy-sized bass from Smith Mountain Lake. You can, too. Local guides and outfitters who know all the best places to cast a reel are ready to show you and your family how to catch the big one. 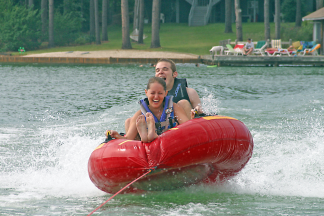 Learn more about fishing on Smith Mountain Lake. In addition to the lake, Carvins Cove and the Roanoke Valley&apos;s many rivers and streams offer great fishing for trout, muskie, crappie and more. The James River in Botetourt County is another of the most popular spots in the region for angling. With the Upper James River Water Trail, there are multiple entry points for the river, giving you easy opportunities to cast your line. You can also book a guided fishing trip on the James River through Twin River Outfitters. Learn more about fishing on the James River. You might leave the Roanoke Valley in Virginia&apos;s Blue Ridge with some great fish stories, and your tales can actually be true! Many local rivers and fishing areas in the region are proud partners of Fish Virginia First - an initiative that highlights the amazing fishing throughout the state of Virginia. The following is a list of fishing outfitters and places where you can enjoy fishing in Virginia&apos;s Blue Ridge.